Looking at the Goldie Hawn - Kurt Russell pair, could it be that the lady wears the trousers? We dare to bluntly put forward the question and to compare their natal charts. We indulge in this little provocation since we know that these actors have been living together for over 35 years and that they are very happy. Quite an abnormality by Hollywood standards! Have they got a secret? Hawn has the Sun in Scorpio and the Ascendant in Sagittarius, while Russell has the Sun in Pisces and the Ascendant in Cancer. Therefore, the former has a strong, intense, charismatic, and domineering personality. The latter seems milder, deliberately withdrawn, and prefers privacy. Russell is fortunate enough to have three planets in Aries, a Fire sign, which echoes the fiery energy of his partner's Sagittarius. In any case, both actors are mainly under the common influence of Water signs. Looking at the first clues of their respective charts, we notice a beautiful trilogy between the signs of Cancer, Scorpio, and Pisces. Discover the free compatibility report of Goldie Hawn and Kurt Russell. A Water synastry... warmed up by Fire? As it may be the case for some couples, being obliged to take on the same astrological problematics sometimes explains the attraction, in addition to the inter-aspect comparison. In this case, we are dealing with two persons who must cope with an alliance between Fire – energy and impulsion – and Water – sensitivity and imagination – and find the same challenge in the partner. Indeed, Hawn must blend her Sun sign and the Ascendant, whereas Russell has to synthesise the sweetness of his Sun and the strength of his Mars in a Fire sign (the planet of masculinity). Not obvious, but enriching when the people concerned are able to come to terms with it, because it allows to warm up whatever is necessary... as well as to ease the excess of energy which otherwise could cause sparks. It ought to be noted that fire is individualistic and that water is empathic. The blend produces a both symbiotic and independent couple. It must also be underlined that both Suns are harmoniously connected, i.e. by a trine with a tight orb. Therefore, their ways of expressing their individuality and their sense of self are quite similar. 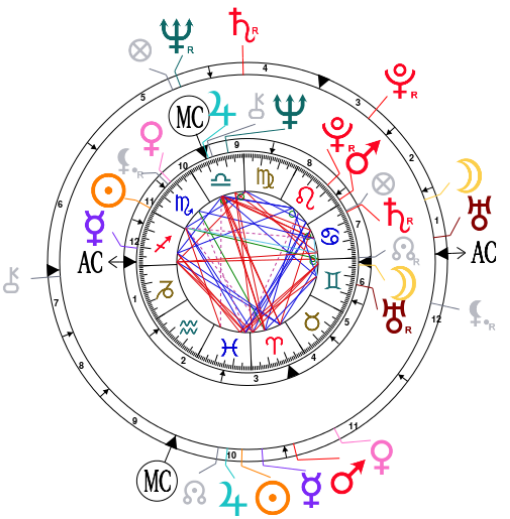 Hawn's Sun trine Saturn (in her natal chart) suggests a steady personality which has not had to struggle against the father model or against authority figures. In contrast, Russell's Sun is opposite Saturn and squares the Ascendant, i.e. a T-square if we consider the whole pattern. Therefore, he is not as self-assured as she is, as stated above, and it is most likely that he had to overcome several hurdles. It is also possible that Hawn inspires him. Let's not forget that Russell is marked by Jupiter, since the analysis of his Sun would not be comprehensive if we failed to mention a nice conjunction with this planet. He is also blessed with his share of luck. As for Hawn, she is influenced by Jupiter insofar as the planet is in conjunction with the Midheaven, thus, dominating. Both of them are prone to see the good aspect of things and to be optimistic, no matter what problems need to be overcome. This is what they often acknowledged in their interviews, when the press asked what the secret of their relation was. In 2017, indeed, they posed together as a pair of lovers, before their common star on the Walk of Fame, openly flaunting the success of their career and of their relationship. Along the same lines – meaning studying the similarities between the charts – we shall examine Uranus' role. Hawn has the Moon in Gemini, conjunct this planet (which is conjunct the Descendant, although technically still in the 6th House). Russell has the Moon conjunct Uranus in the 1st House (the ego). Therefore, both are astonishing or even unpredictable when in private. Their unusual needs do not correspond to norms or to social conventions. Russell is like that almost naturally (because in the 1st House), while Hawn is like that perhaps due to mimicry, since the sign of Gemini is gifted, even unconsciously, for reproducing any behaviour. This is only a hypothesis. The synastry also highlights the nice aspects between Hawn's Mars, in early Leo, trine Russell's Sun (although in Pisces). He has Mars in Aries too (cf. above), and although the orb is too wide to be taken into account, he does represent the type of male that Hawn finds attractive. This is all the more true that her Pluto is definitely trine this Mars. There is no doubt that, on the physical level, Russell instinctively knows how to meet the deepest needs of his life partner. As far as communication is concerned, there are numerous assets too, since both Mercurys are involved in positive inter-aspects. Although Hawn and Russell have been experiencing an exemplary marriage, it is most likely that they also had to put in a great deal of effort, because their charts display a few challenging aspects. We shall mainly discuss the impact of Saturn, a very important planet in synastry, for he may herald deadlocks or obstacles to be overcome which require perseverance. This is nearly unavoidable, if the persons in love are willing to build a lasting relationship. The Saturn of one partner sextiles the Saturn of the other partner. This is of course a generational aspect, yet an additional small indication which enables them to stave off the risk of coldness or of lack of confidence. Whatever the hurdles might be, it is obvious that they managed to get the best of the other one's chart, and that they had a wonderful set of potential assets to start from.